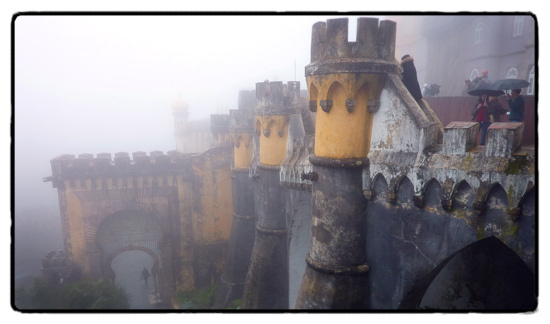 Our mission: to visit as many of the Palácios of Sintra in 24 hours as humanly possible. There was a flight to catch at the end. We were cramming. Naturally there were conditions: I had to keep my sister fed and tea-ed up along the way, and keep her in a good mood. We were initially thwarted by the rain and a disruption in the space-time continuum that made it take four hours to drive down instead of the usual two. When we finally arrived in Sintra Vila, the President got in our way. I thought it was rather busy, even for a Sunday, and then the Cavaco Silva flags started appearing. Thousands of PSP supporters, aka Tories, Liberals & Republicans had taken all the parking spaces. It was all too stressful. We ordered a pot of tea at the nearest place. His Presidentialness came, saw, did a 20 second soundbite and then it was all clear and a green light for us to launch the mission. We started, as you do, with our mantra, A Quick Tour is a Good Tour. Fortunately the wind was on our backs; the first Palácio was closing in 45 minutes. Recommended tour time 1.5 hours. Perfect. #1. 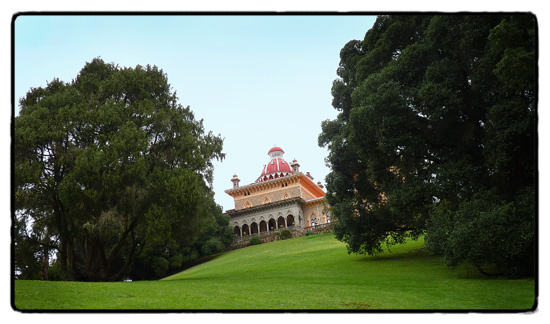 Palácio Nacional de Sintra. 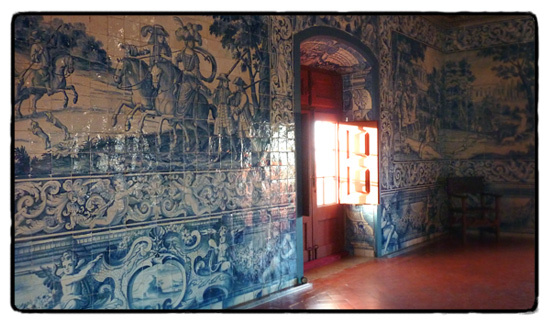 Hiding behind its comparatively boring facade are some fabulous azulejos, brilliant ceilings and nice birdy decoration. 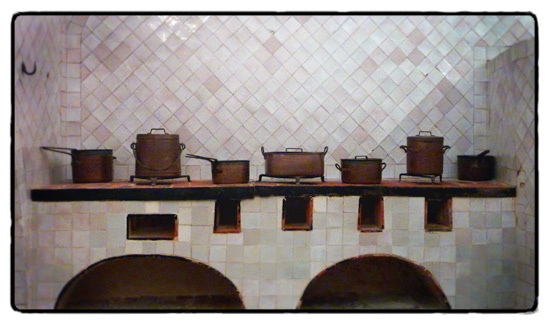 The kitchen is good too. 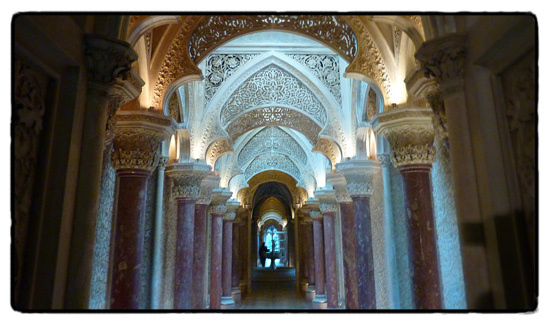 The story is that this palace’s foundations date back to the 10th century Moorish occupation. 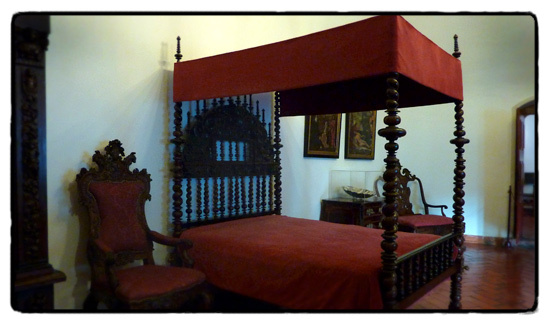 Portugal’s first King, Afonso I, took over the palace in the 12th c. and did some remodelling. In the 12th-13th c. it was remodelled again by King Dom Dinis and then again by João I in the 15th c., whose work is most of what you can see today. 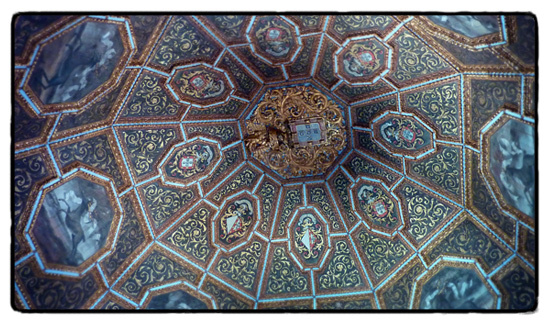 João takes credit for our favourite room, with its magpie decorated ceiling. Later in the 15th and into the 16th c. it was renovated again by Manuel I who was loaded with funds from the Age of Discoveries. Fortunately this was a man with money and taste. They even named an architectural style after him. 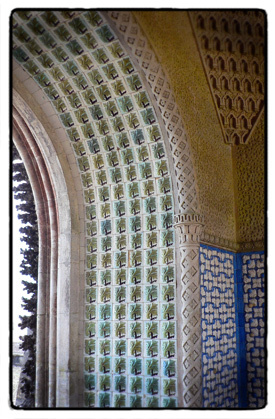 So far the palace has Gothic, Mudejar (Arabic) and now the curly, feminine and hyper-decorative Manueline architectural style. During this medieval period the palace was used as a hunting lodge, a summer house and as a haven from the plagues of Lisbon. In 1775 it had to be fully restored after the massive earthquake. 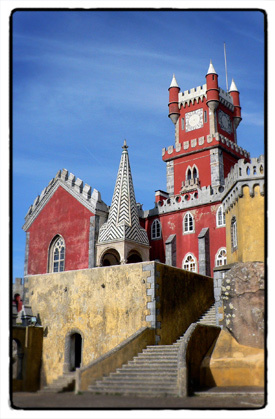 Sintra hit another fashionable period in the 19th century and the palace was again more frequented by royalty. After the 1910 fall of the monarchy, it was again redecorated and restored and became a museum and national monument in 1940. It has world heritage listing. Night was upon us, so after a smashing dinner at the Cantinho do São Pedro, we went to a nameless bar that served beers topped up with brandy and then onto safari-disco-nights club where we drank several margaritas and did the bus-stop with an Argentinian football team. Someone invited us to a party at the Argentine Embassy which had a swing orchestra and champagne served by butlers wearing tangerine-coloured tuxedos. The white truffle and turtle-dove canapés were terrific, but we couldn’t stay long as the sun was rising and we needed a little kip before getting back on the job as soon as the palaces opened. Day two. The pressure was on. Three more palaces. We donned our gucci sunglasses and headed out into what was to be a truly glamorous day. This former private home was built in 1858 by an Englishman with tonnes of dough and no shortage of imagination and style. The architectural style is Mughal (best known example of Murgwaline architecture is none other than the Taj Mahal). It’s surprising how at home it looks in Portugal, what with its similarity to Moorish design and Portugal’s connection to India. On the other hand, it is a house like no other I’ve ever seen. It is utterly extraordinary. Sir Francis Cook (at the time the third richest man in Britain) was a art collector and a keen gardener and his house is surrounded by a magnificent, exotic, 30 hectare garden. This park contains plants from all over the world, including Australia, which surely must have been added later than the original plantings before Cook bought the place. 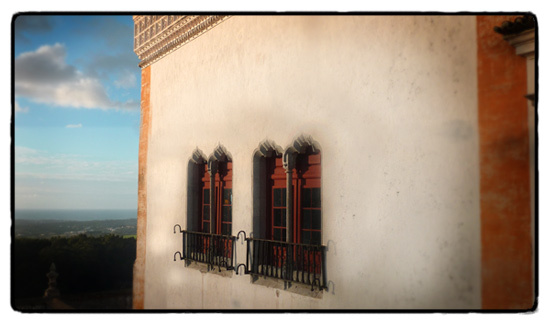 Monserrate Palace is undergoing restoration. It was privately owned by the family of Cook until the 20th c. when it was bought by a developer who intended to split up the land and sell it piecemeal. In a momentary flash of enlightenment the government of Mr António Salazar decided it would be worth saving it as state property, and then promptly forgot about it for forty years. 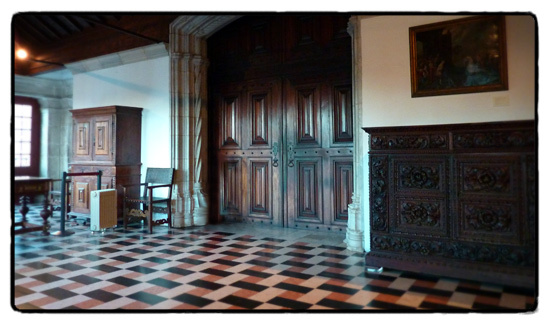 I believe the entire house could be visited by appointment before these restorations began (probably to help fund what must be a gazillion euro project), but only the ground floor was available for us. I can’t wait to see the whole thing finished, it will be phenomenal. Mid morning now, time for tea. There is an excellent tea room in the gardens, with real tea and scrumptious little cakey business on the side. We needed it. Disney meets the royal family. This palace is so much fun that I nearly always take visitors here. I love it. The royals, Ferdinand and Maria helped design it and they must have had a sense of humour. 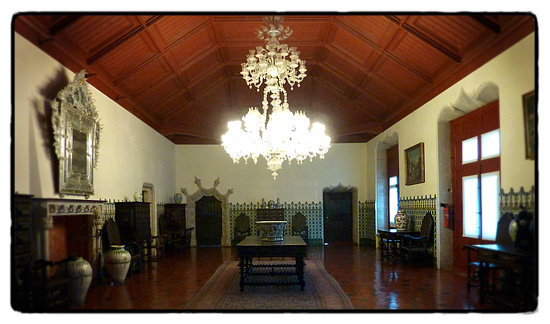 As modern as Monserrate, this summer palace was built c1850. Apparently they employed an amateur architect from Germany, and certainly it has the whimsy of the fairytale castles of Bavaria. The style is called Romanticism which is really just a bit of this and that from everything gone before. It’s eclectic. It’s high camp. The strange thing about Pena is the interior. Ornate as it is, with neo-baroque painted marble pillars, manueline stonework, trompe l’oeils and prettiness galore, there is barely enough room to swing a cat. You’d think it was built for hobbits. Low ceilings, corridors that have no where to go but to pass through bedrooms and servant’s quarters, offices no bigger than broom cupboards. It’s a royal doll’s house. Pena is built very high in the hills of Sintra. Indeed on our visit it was in the clouds. With rain. No we didn’t see the gardens. Yes we took the stupid little trolley car. The fog was a photographic handicap, so I’ve included pics from a sunnier trip. It was time for tea again. I recall that the cafe at Pena was forgettable. Que pena! Yes, we’re on the home straight now. We are storming through these palaces like Arnie through the jungle. 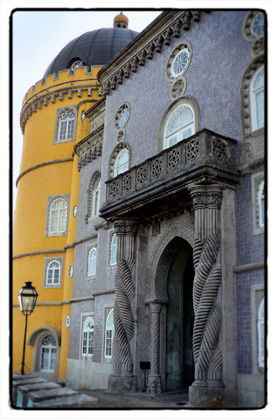 Queluz is not in Sintra, actually, it’s about halfway to Lisbon. Described as the Versailles of Portugal I expected a likeness similar to the way Aveiro is to Venice. For those who haven’t been to Venice, that is. Not simliar. Obviously large from the outside and suitably pink, my jaded third-palace-of-the-day eyes, began to sparkle with curiosity. On entering the first room, I had to eat my words. 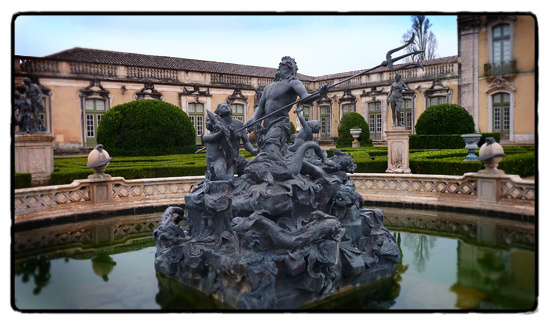 Of course it’s no where near the size of Versailles but the palace of Queluz is gorgeous. French rococco indeed. Mainly built in the 1750’s by Prince Dom Pedro and niece/wife/Queen Maria I who was Portugal’s first Queen, inheriting the monarchy from her father King José I. 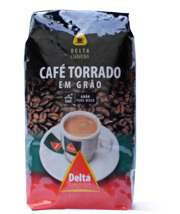 The project had been started by King João V, Dom Pedro’s father, so it basically belonged to Pedro although it was also in part inheritated by João’s successor José. 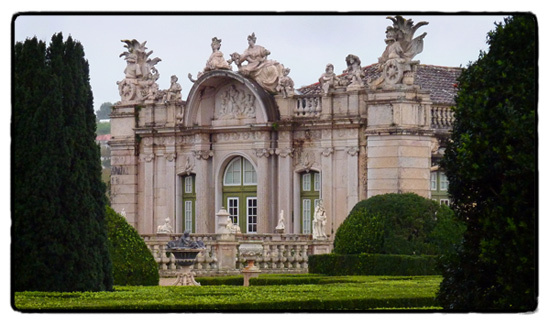 Queluz continued its construction during his reign, but after the Lisbon earthquake José suffered from claustrophobia and moved the royal family to live in tents in Ajuda. He gave the palace to Maria, already married to her uncle 23 years her senior. The marriage was a famously happy one and they had 6 children. 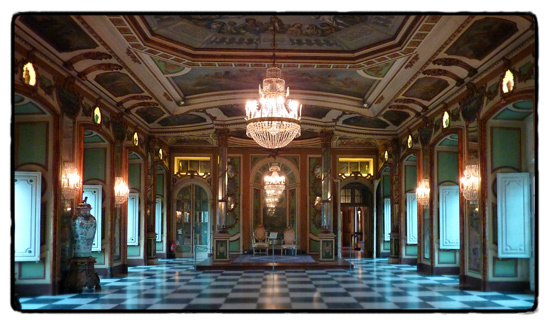 After the death of her husband Maria started to go mad, here in this very palace. Retrospective diagnosis would have her suffering from Porphyria, the same as England’s George III. But in those days she was just plain mad. It would be understandable if she was living at Mafra, built by her grandfather João V, with its Vatican-like vast proportions (impossible to heat) and its vulgar ostentation. But this, Queluz, is delightful. It’s impossible to imagine anyone’s harrowing screams here. The design is so musical that we had to resist the urge to skip and dance through the rooms. We skipped into the gardens instead and admired their loveliness, especially the Bernini inspired fountain. Every corner of the exterior from the gardens is photographic. But then it started to rain and we found that we were lost. The signs to the exit were both few and obscure. We ran around the gardens screaming and going hither and thither, getting wetter and now needing a little ladies room. After three and a half hours we were finally saved when my sister saw an open door, amongst so many doors, back into the palace. We were very much in need of a cup of tea then. Unlike Mafra, the rest of Queluz town is rather unfortunate. It’s ugly, and we couldn’t find a half decent cafe. It wasn’t right to end the day like this after such a successful mission. Especially as I’d unwittingly left the best palace ’til last. Four palaces in 24 hours was enough. I wouldn’t recommend more, even if you have no interest in tea or photography. It just shouldn’t be attempted. You’d get palaced-out. 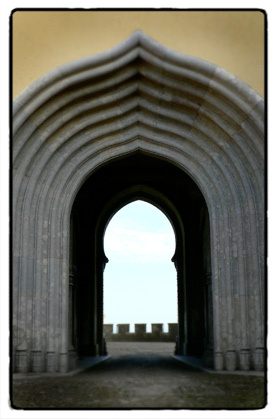 There are more palaces in Sintra to see, however. 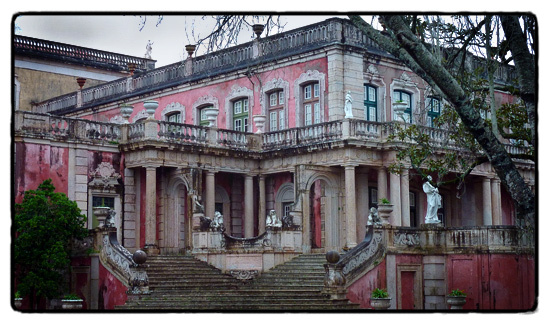 Next time I’m going to Quinta da Regaleira, and outside Sintra there are even more Royal Palaces. When will it end? Beautiful photos. I can’t wait to go there again! Argentinian football team??? Argentine Embassy??? Eh???????? Darling! It was all perfect innocent! Its really silly that I live relatively close to all 4 of these palaces and yet have never ventured into any of them. 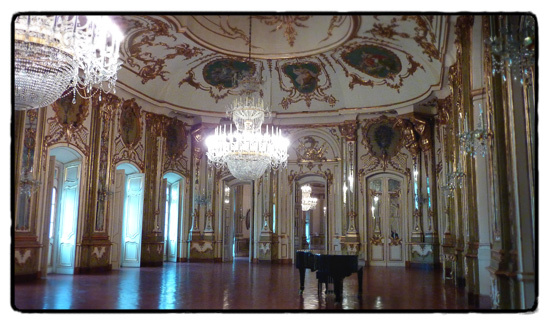 But thank you for this little preveiw, they all look quite divine, especially the Palacio de Queluz. 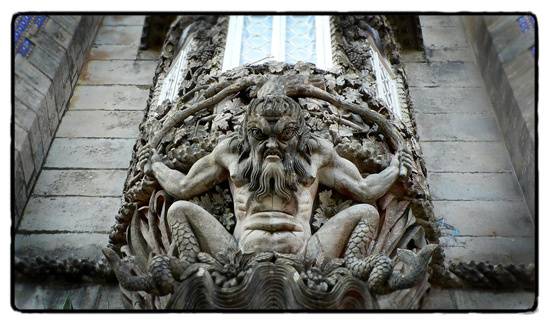 Incidentally, I have been to the Quinta da Regaleira, its fantastic, I highly recommend making the effort, but not on a tight time-schedule, theres so much to see. @Emma, not to be a creepy blog stalker or whatever, but if you are planning to come through this way again and fancy a quejada de sintra (or 20) I would love to meet up for coffee. @Kerry, Yeah I lived for 4 years in Queluz and never got go near the palace. On the other hand Quinta da Regaleira was splendid, it made me feel like on a treasure hunt the palace is not so big but the “garden” was just too much fun. 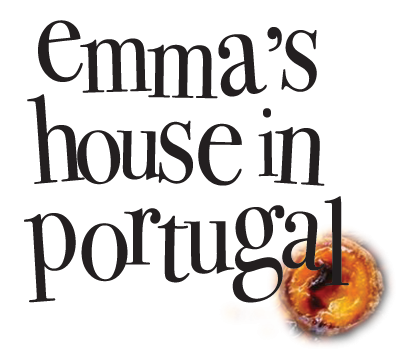 Love your adventures in Portugal Emma. i do love your blog’s and your photography. you have a great eye, and the rest of yer is not dad either. Hi Maria. 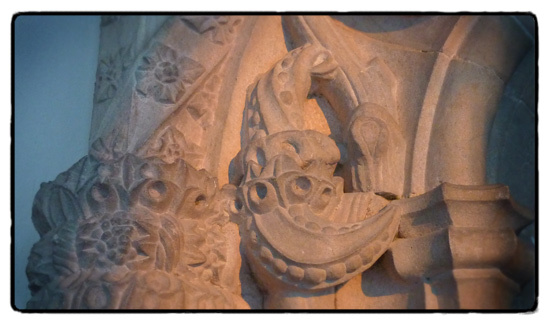 Sintra is just the place for a courtship. I wonder is Pena was all grey back then? 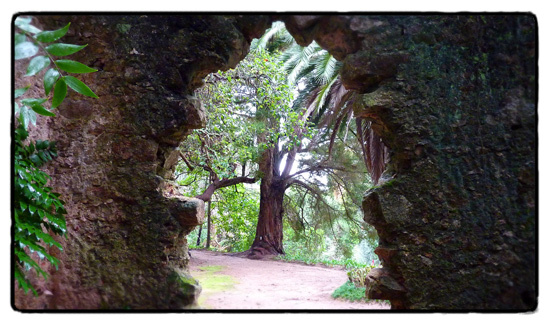 Amd you must, must visit Quinta da Regaleira. Wow! What a magnificent display of excellent photographs. 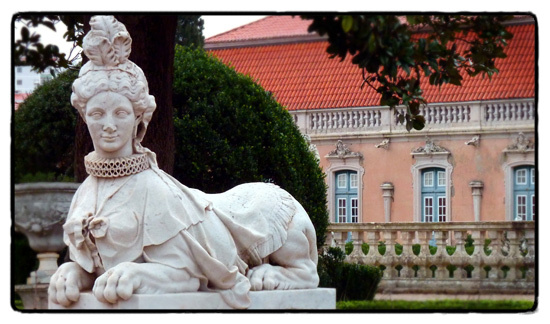 I never realised that Portugal had so many palaces. Your commentary beneath every splendid scene is so descriptive and mind appealing, that I can imagine that I am alongside you taking the tour too. You paint a mind boggling journey and I am certain that the Portuguese Tourist industry would welcome your pictures and settings as they would entice many newcomers to Portugal. Yeah! 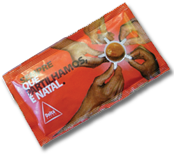 Shouldn’t Turismo de Portugal welcome this blog! Shouldn’t they maybe give me a job? Sponsor the blog? Just send me a cheque in the mail for services rendered? 🙂 I’m going to go and post it on their facebook now! Thanks Vern! Excellent report again. The photos are stunning!! 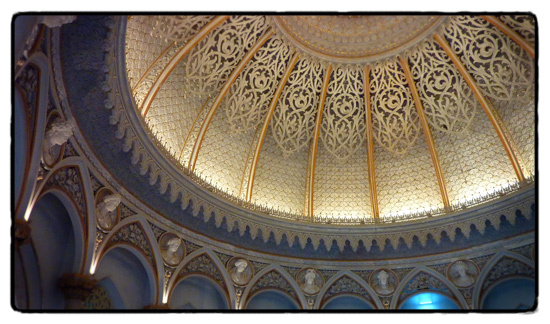 I just went to the Palacio Pena today and yes, it is quite claustrophobic inside. I was shocked by the size of the “grand hall”. I could touch the chandelier hanging from the ceiling. I was also a bit peeved that I couldn’t take pictures inside. How did you get the black borders around your photos? I used to do that in black and white film photography class. Fell in love with Sintra, despite slogging all the way up that hill in heat (there was a queue for the bus and it “didn’t look very far” to my misguided eyes). Desperately need to see Monserrate and Queluz. Happy to have been introduced to your blog.